I have long been an advocate of the cross-body bag. My fondness for the design stems from years of taking public transportation to work back in my student days when I lived in the Chicago area. The immediate benefit of a cross-body design is that it allows the bag to be carried hands-free. But the confidence a cross-body design conveys, in my view, goes beyond that convenience. Having the long strap of a purse arranged cross-wise over my outerwear, the top of the bag in view and the bag close to my body, gives me confidence that no one can reach into the bag and steal its contents. With few exceptions, my cross-body bag design of choice has a top zipper to provide an extra sense of security. It takes more effort to unzip a zipper than to turn a clasp on a flap-style bag. The cross-body bad is perfect for travel. Noting that the fashion choices of the former actress who became Prince Harry’s wife “are a refreshing break from the style dictated by royal protocol,” the article references, among other choices, her messy bun, her refusal to wear pantyhose, and her cross-body bags. Illustration: Breaking with royal protocol with a cross-body bag from Australian designer Oroton at an event in 2018. A do recall noting that Princess Diana routinely carried a clutch-style purse that matched her ensemble. I attributed this fashion choice to the refined elegance of the design and the likelihood that a royal likely needs to carry not much more than a handkerchief. While I don’t anticipate most of us need be concerned about the need to shake hands with too many people, positioning a clutch to prevent an undesired peak of cleavage might be a skill worth mastering. Menswear-influenced fashion plays a significant role in most professional women’s wardrobes. Luxe fine fabrics of wool and cashmere and subtle plaids bring elements of quality and elegance to a woman’s style. Today, chic pantsuits provide ease and comfort that avoid pesky issues about hosiery and heels (so long as the heel height is correct – reference my last post). I’m having an “Oh No” moment, however, with the promotion of menswear-influenced wristwatches paired with women’s formal wear. 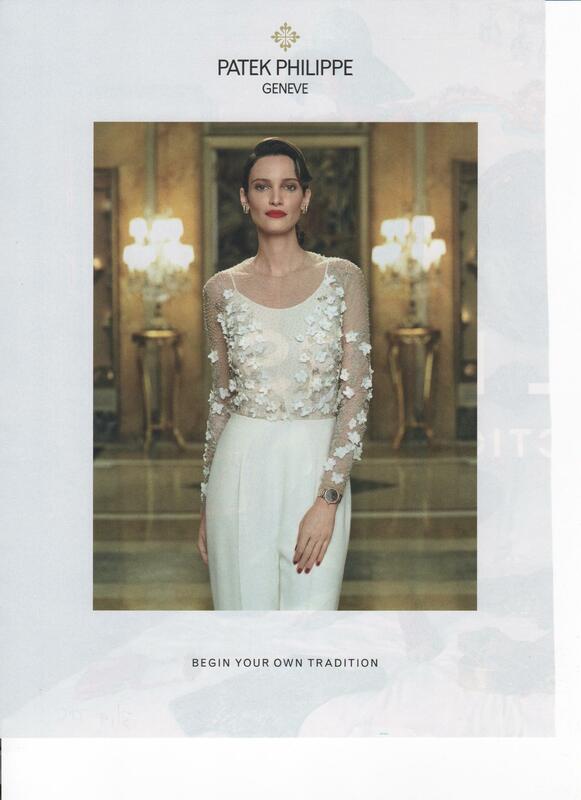 The perfectly gorgeous wristwatch in the ad shown here from Swiss watchmaker Patek Philippe, does no favors to the wearer paired with a stunning evening look, particularly when the evening look is so ethereal and delicate as the flower-appliquéd ensemble pictured. 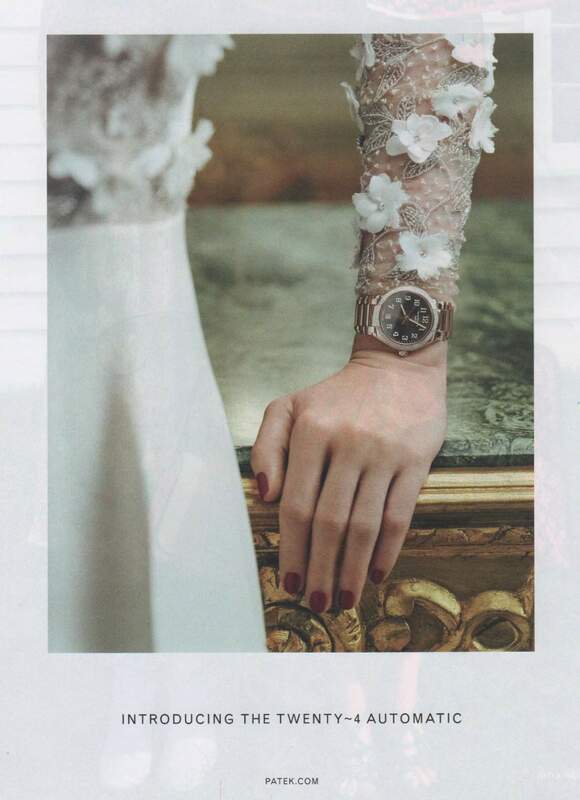 The watch interferes with the line of the sleeve and looks jarringly out of place. The lovely model would be much better accessorized with substantial earrings that complement her long neck and coordinate in style with the top. A more delicate evening wristwatch would be a lovely option. By all means, enjoy a beautiful menswear-inspired watch, but leave it at home when heading out in evening wear. The ensemble consists of bootcut trousers (“a flared leg elongates your figure”), a layering tee in basic white, and a polished blazer, accessorized with hoop earrings, a classic wristwatch, a sleek clutch (recommended for after work activities), and kitten heel pumps. The look is a genuine classic – a great look for when professionalism is paramount. The recommendations for a colorful scarf and a roomy tote are excellent, as is the idea of comfortable shoes for one’s commute. However, the completely flat foldable shoes pictured do not work with the bootcut pants for the simple reason that the pants have been hemmed at a length appropriate for the two- or three-inch kitten heels pictured. Wearing the flats with the pants almost guarantees that you’ll be stepping on the bottom of your pants, soiling them if not also tripping over them. This simply doesn’t work. What is the solution? The hemline determines your heel height. Find shoes comfortable enough for the commute that are the same heel height as the shoes you intend to wear at the office. Save those foldable flats for commuting on days when you are in a dress or skirt. It’s year-end 2018, and what a year it has been. The optimist in me kicks in as I contemplate 2019, and I wish to share a couple of recent items I read that made me smile. Whatever special treat you choose to eat (the perfect heirloom tomato, fragrant baked apples, the pecan butter crescent cookies you make for your loved ones every holiday season), and however you choose to adorn yourself (real jewels or faux, vintage or artisan), appreciate every bit of the deliciousness and the beauty. Revel in the beauty. Share the joy. Wishing all my readers much beauty and a wonderful New Year! 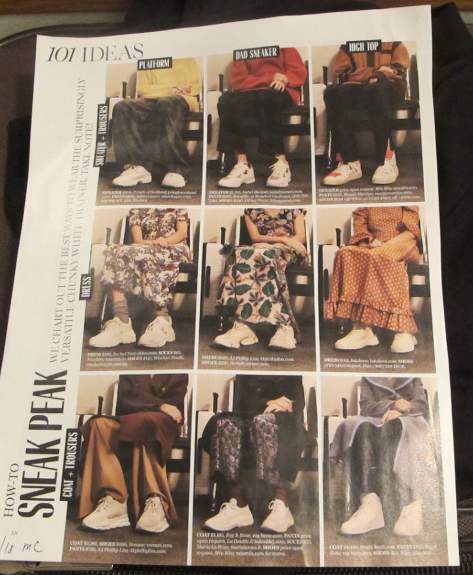 It is with some amusement that I saw this page of 101 style ideas in the November 2018 issue of Marie Claire. Nine examples of wearing athletic sneakers are described as “the best ways to wear the surprisingly versatile chunky white trainer.” While six of the examples pair the sneaks with trousers, worn either with a sweater or a coat, three show the white shoes paired with long print dresses. The look of white sneakers with a dress or suit, or even with dark trousers, has not aged well. It draws the eye to the wearer’s feet, and the feet look bigger than usual in the chunky white shoes. There are all manner of low-heel pumps and flats in dark colors that can match trousers or tights, or coordinate with the colors in long skirts, and provide both comfort and a much less jarring version of style. What all button earrings have in common is that they are as wide as they are tall and symmetrical. They are universally flattering because they draw the viewer’s eye up to the earring wearer’s face. Longer dangling earrings, in contrast, can draw attention down to the wearer’s neck. 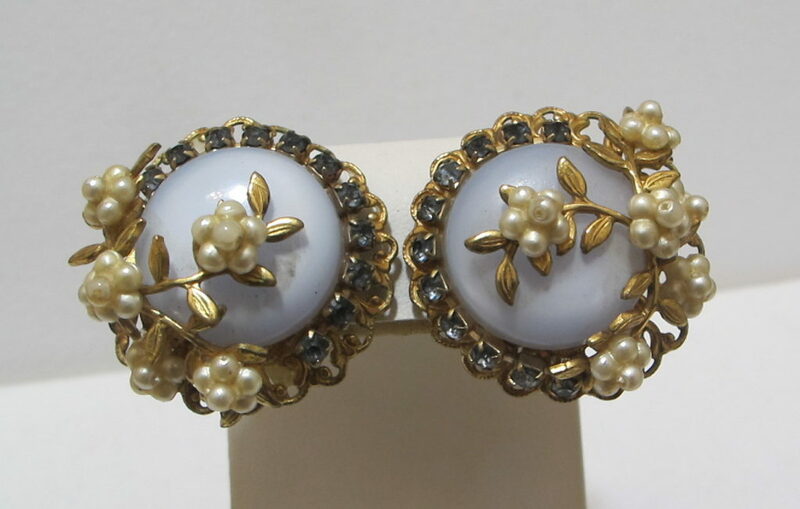 As Heller notes, button earrings were a staple in the 1960s. Alexis Carrington wouldn’t be dressed without her clip-back button earrings on Dynasty. You can find a treasure trove of vintage button earrings on eBay that won’t break the bank. There you will find innumerable clip back and older screw back earrings for non-pierced ears, as well as post-style pierced earrings. If you decide to explore the wealth of offerings on eBay, don’t limit your search too much. The term “button” is considered an old-fashioned term and is not used in most listing titles. Instead, do a search looking for the specific features of the earrings you seek: round, square, star shape; rhinestones, enamel, (faux) pearls, Lucite; translucent, luminous, colorful, one color, gold or silver tone, sparkling, over-the-top. One inch earrings, about the size of a quarter, are the standard for earrings that are eye-catching but office appropriate. Go larger for even more visual impact. It’s time to bring back button earrings. If only Oprah had come clean, and written “If you’ve – like I have – had the difficult experience of trying, and failing to find clothing . . . .” This is part of a pattern of Oprah’s downplaying and even ignoring her personal history relating to size. Why is she so coy about what has been in plain sight, when her personal experience could be so helpful to her readers? Illustration: Emme, perhaps the original famous full-figured model, is featured in the magazine spread. Before her famous reveal of the wagon full of fat representing the weight she lost on Optifast back in the 1980s (a reveal that got me and countless others to sign up for the program), Oprah’s shopping habits had some notoriety in the upscale stores of Chicago’s Magnificent Mile on Michigan Avenue. According to a saleswoman at one of those stores, Oprah’s assistants would remove size tags from the designer or bridge garments purchased on her behalf so she wouldn’t see the double-digit sizes being purchased for her. 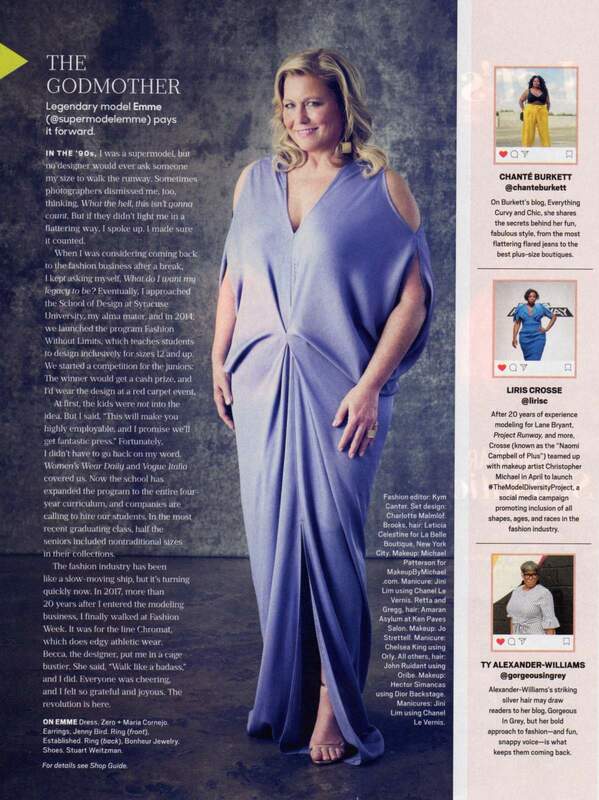 I was advised by another style expert that Oprah’s assistants would on occasion purchase more than one identical designer garment and then piece them together to create a single garment that better fit and flattered the celebrity host. Of course, Oprah may have been ignorant of some or all of what was being done to shield her from the harsh realities of the sizes she required – thus, the subterfuge by her shoppers and staff. Are these stories that were relayed to me by people in the fashion and style industries true, or mere urban legend? I can’t say for sure, but they do reflect remarkable creativity in sidestepping the issue of size. On a more personal note, I introduced a line of fine jewelry for the plus-size market in 2003. 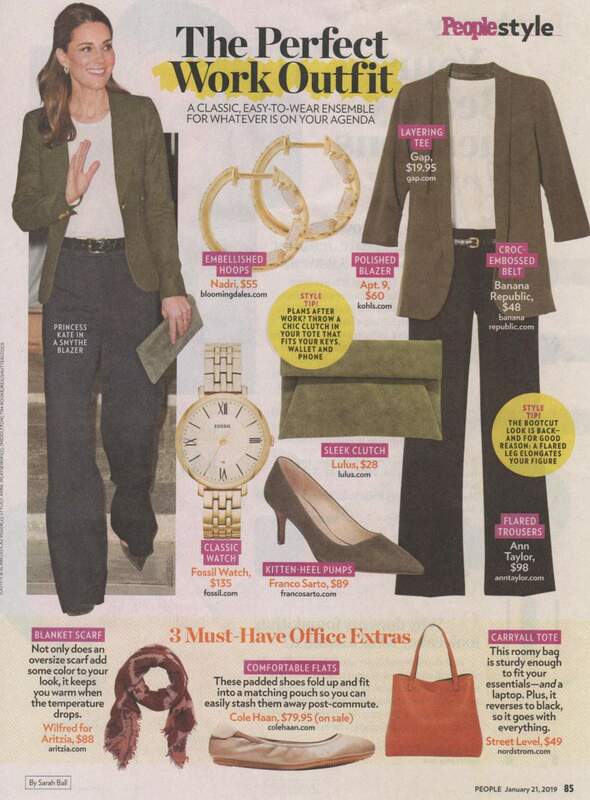 My pieces were featured in Good Housekeeping and InStyle magazine, among others. 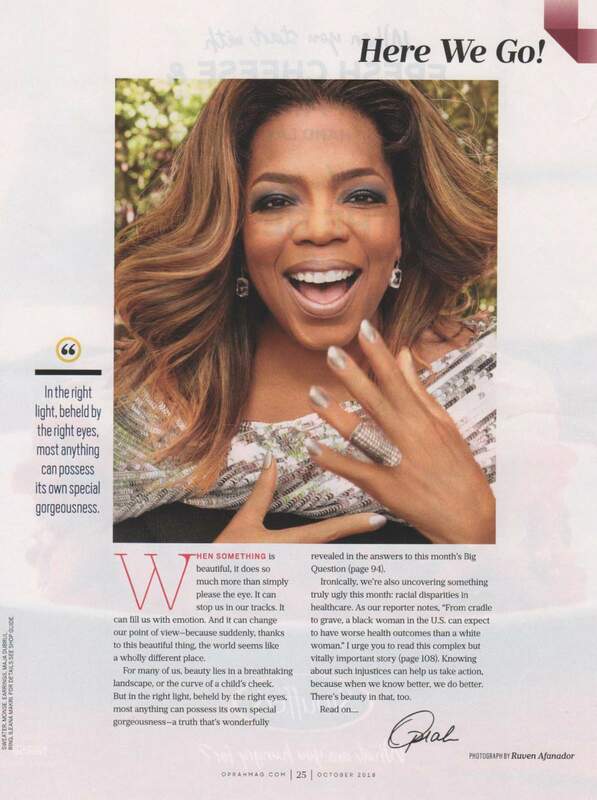 However, when my publicist contacted the Oprah organization, she was told that the magazine staff was not interested in looking at or promoting my offerings “because Oprah is not plus-size.” Even if that description was true at the time, Oprah has demonstrated through her organization over the years a disdain for any designer catering to full-figured women. It’s nice finally to see a more inclusive approach to fashion. 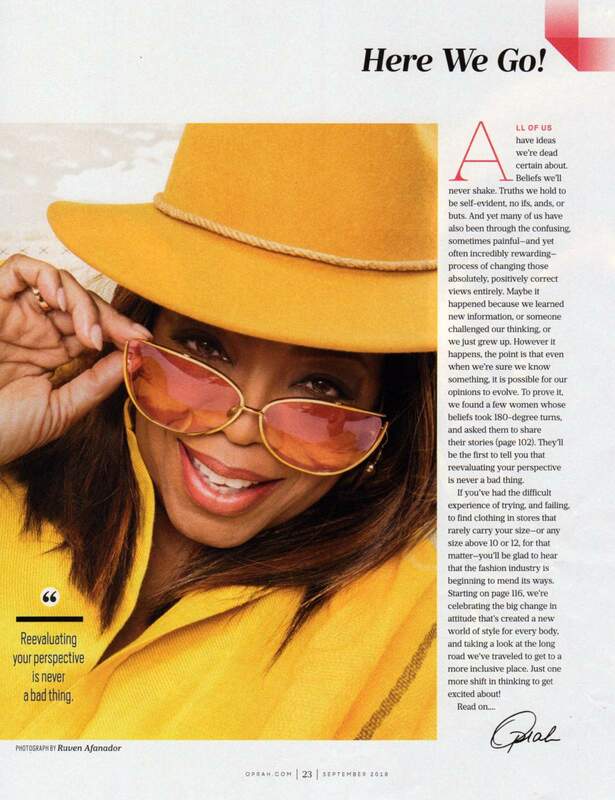 There’s an interesting little caption on the photo of Oprah on her editorial page, which reads: “Reevaluating your perspective is never a bad thing.” Oprah, let’s hear your story of dealing with dressing as a woman wearing size 12 and up. Now that would give us some perspective on the fashion world’s change of attitude. Animal prints are a perennial fashion favorite, and they are back again this fall. Leopard print coats in particular are seemingly ubiquitous, although they require a certain energy to wear. These are not coats for those with shy, sweet personalities. These coats are attention-getters. 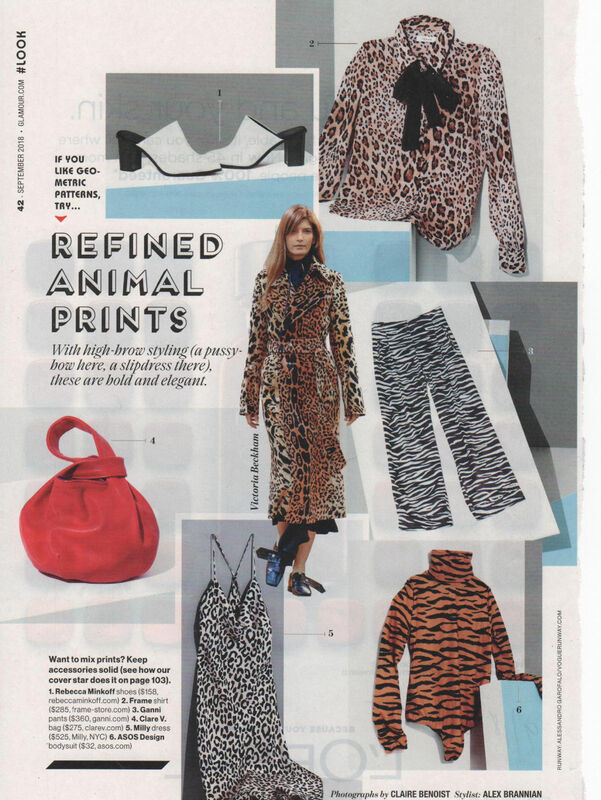 Below, a sampling of this season’s leopard print coat offerings, from the August issue of InStyle magazine. The high-energy symbolism of the leopard coat can be seen, for example, when beleaguered advice columnist Plum Kettle, the protagonist of Dietland on AMC, begins to step out from her old life and routines on the road to self-discovery. A newly exuberant Plum appears in several episodes wearing a leopard print coat. If you love animal prints but a full-length coat may be a bit too much – trust your instincts here—there are all manner of accessories and garments that can bring a dash of animal print without taking over the look. Some examples can be seen in the fashion spread from the September 2018 issue of Glamour pictured above. The leopard print blouse would be striking with black slacks, skirt or suit. A revved-up variation on the animal print is Gucci’s vibrant panther print. Singer and actress Kesha is lost in the Gucci dress she wears pictured in the August 27, 2018 issue of People. The print draws the eye, and the lovely woman wearing it is not the focus. Contrast that with singer Nick Cannon wearing a tracksuit made of the same panther print material. Cannon’s energy rocks the print; it doesn’t wear him. If the energy conveyed by the print suits your personal energy, it can be a great match. 24 karat gold is, of course, pure gold – and it is unlikely you will ever come across any jewelry represented as such. 22 karat jewelry is about the highest karatage one comes across. Much more typical in the United States is 14 karat and 18 karat gold jewelry. 18 karat gold is 75% gold and 25% other metals; 14 karat gold is 58.5% gold and 41.5% other metals. Note that, of the pieces described as “gold,” all are 14 karat except the Jennifer Meyer earrings, which are crafted in 18 karat gold. “Gold-plated” refers to a thin plating of gold over another metal. That metal is likely to be a base metal such as nickel, bronze or lead. Because of the thinness of the gold, items that are gold-plated may need to have the gold plating renewed from time to time to keep the same appearance. “Gold vermeil” refers to sterling silver covered with a layer of gold (usually by plating). This differs from gold-plated in that the metal underlying the gold is not a less expensive base metal. 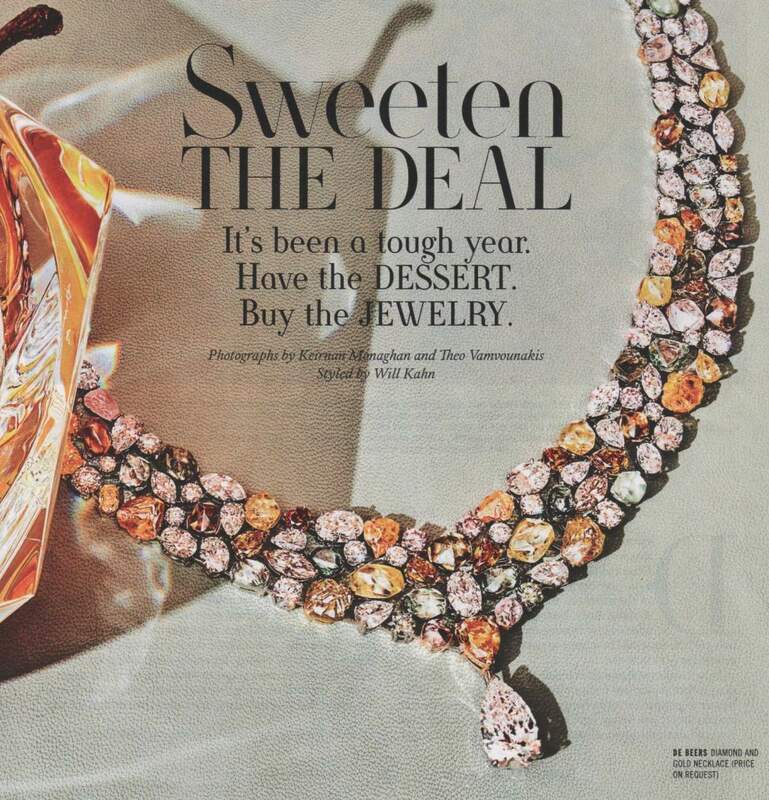 The Nalin Studios ring should have been described as gold vermeil in the magazine article. You may come across jewelry, especially vintage jewelry, described and marked “gold-filled,” which refers to a process by which the item is covered in a layer of gold at least 1/20th of the total weight of the metal in the piece, in 10, 12 or 14 karat. Gold-filled jewelry has more gold content than gold-plated jewelry. By all means, glam up your look with “gold” chains and pendants. But do your homework, know what it is you are buying, and then buy with confidence. For years I blogged for the jewelry industry, following trends and the direction of design in bejeweled accessories, fine and faux. For more years I have been a collector of vintage costume jewelry and seller of those little treasures on eBay. As a keen observer of what’s happening in jewelry, I am always intrigued to find a designer who pushes boundaries, even if their creations may not be to my taste. I am saddened to see designers (in some cases, well-known designers) who outright copy vintage designs and pass them off as their own. (I have called out a few of these designers in my blogs over the years.) And I am delighted to see that current trends inevitably relate back to vintage designs that are available at prices accessible to just about everyone, no matter how small the budget, on eBay. For example, mix and match bangle bracelets are having another moment in the spotlight. 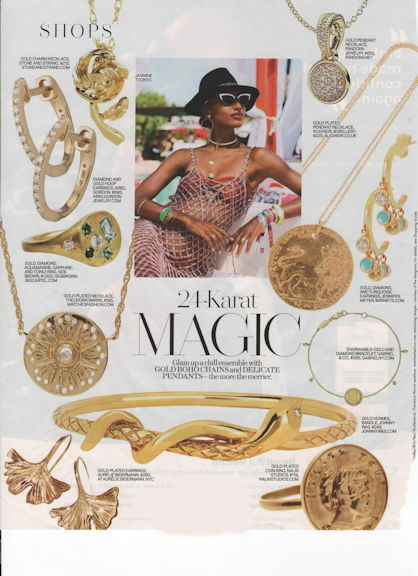 The July 2018 issue of Marie Claire suggests that its readers “Forget the bling. Keep things light and bright with enamel jewelry in flashy shades,” and adds the style hack: “Layer on dainty bracelets and stackable rings to create a look that’s all you.” Among the bracelets pictured are a $625 molded cuff of red enamel on sterling silver from Marla Aaron; a $475 red cuff of enamel on brass with gold vermeil from Nora Kogan; and $75 multi-color striped-effect enamel stretch bracelets from Roxanne Assoulin. As I write this, there are over 5,600 enamel bangle bracelets available on eBay, starting at under $5 each plus a modest shipping charge within the United States, and often costing less when purchasing multiple bracelets from the same seller. In other words, for $75, you can put together an armload of enamel bangles. Choose carefully, of course. Buy only from sellers with excellent ratings who take the time to disclose with care the condition of their wares. Vintage pieces are often much better made and more interesting in design than current offerings, but they may show minor age-appropriate wear. Keep in mind that a spanking new $625 enamel cuff may show some scuffs and scratches after a very few number of wearings. Think outside of the box relative to the trend, however, and consider vibrant striped bracelets made of materials other than enamel. 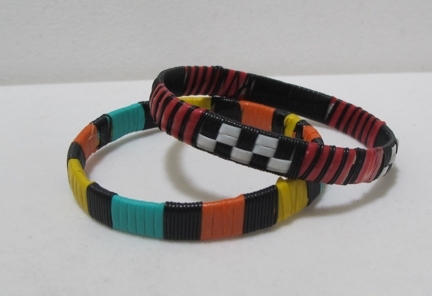 For example, in my eBay store, I offer a pair of vintage woven straw and cording striped bangle bracelets for $2.98 plus $2.95 shipping. That is not a typo. Take these examples as just a starting point for finding treasures. From time to time in my blog, I’ll look at some of the current trends in fashion and their vintage counterparts available in my little eBay store, singerplum. eBay branded shipping materials have adopted a new slogan: “Shop like nobody else. Because you aren’t like anyone else.” How thrilled I was to see this — not just for the message, but because, bless ’em, the message is stated in correct English too. If you’re not a regular on eBay, check it out. You may be surprised and delighted by what you find. catherine on Overture: What’s It All About?